Most of the content on this blog is language oriented, but every now and then I like to talk about a broader topic–our approach to educating our children, namely, homeschooling. Let me get this out of the way first: When it comes to education, I am a proponent of liberty and choice. I am glad that all fifty of the U.S. states have seen fit to provide tax-funded education for their citizens. I have various objections to how public education works and doubts about its overall effectiveness, but I am glad “free” education is an option for all American young people. I taught for ten years in a public high school and found it difficult, often frustrating, but overall enormously fulfilling. I am proud to say that I made a difference in the lives of many young people during my public school tenure. I did not leave that career out of dissatisfaction. I have often considered returning to it one day. Private schools have a place, as do public charter schools. My point is that I don’t believe homeschooling, or any single approach to education is necessarily the best option for everyone. I know of homeschoolers whose children would be better off in public school and public school families who would probably benefit from private or homeschooling. I believe parents are not only responsible, but uniquely qualified to determine the best educational options for their children. That’s not to say all parents make the right choices, but I believe we should have the liberty to choose, even if we choose badly. The alternative seems far worse to me. All this means that the Wasko family has homeschooled because my wife and I have agreed that it is the best option for our family. My children, thankfully, agree as well. If you send your children to a public, private, or charter school, please don’t think I question your decision. I have friends whom I greatly respect who thoughtfully send their kids to private and public schools. There is no single right answer when it comes to schooling options. In fact, I hate the hostility that often arises among the various education camps. Too many traditional schoolers feel threatened and defensive in conversations with homeschoolers. And too many homeschoolers feel threatened and defensive when speaking to public school advocates. People have strong, differing opinions, and I suppose there’s no avoiding the polarization that occurs, but I want you to know that if your choice to send your kids to school is deliberate and intentional, I have no beef with you. I don’t want to argue. I certainly don’t want to deny your rights to take advantage of public education. Of course, I want to retain my equal right to school at home, but as long as you don’t oppose that right, we really can get along. My kids are smart, personable, talented, and social. That’s probably due more to the fact that they take after their mom than to our homeschooling, but we, at least, didn’t mess them up. My oldest is in college with a bunch of academic scholarships and my number two is applying to a number of good universities. They all missed out on some things because of homeschooling — things like proms and student elections and pep rallies — but we all think we have come out ahead in the long run. My wife was an honor student, cheerleading captain, and homecoming queen of a large public high school. I was a regional wrestling champion and student body president. We both have wonderfully fond memories of our successful high school careers. I liked high school so much that I went into teaching right out of college. When we started attending a church with a large number of homeschooling families, we thought it was the weirdest thing ever. We both had looked forward to our children having the kinds of rich high school experiences we’d had. We both agreed that there was no way we would ever homeschool our kids. Ever. Obviously, we changed our minds. And I’ll explain how that happened in Part 2. 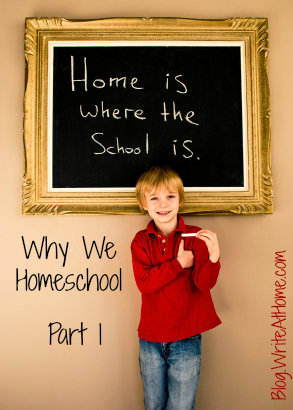 I will also talk about some of the reasons we homeschool. Not to convince anyone to homeschool who isn’t already inclined, but to provoke some thought among tradschoolers¹ and homeschoolers alike. Note: Since publishing this article, I have discovered an alternative word to tradschooling: awayschooling. Brilliant. I know you’ve got comments about this. Feel free to leave them. Feel free to disagree or object. Just try to be nice about it, okay? Where can I find, Why we Homeschool, part 2? It can’t be found. In fact, I forgot all about creating Part 2! Thanks for the reminder. I’m in need of a topic for the coming week, so it might be coming soon! I will hold you to that! After 26 years of homeschooling, our youngest child enrolled in private Christian school this last year. We’ve all felt blessed by the new season of life and I have more time to focus on my freelance work. Your views on homeschooling and life are balanced and refreshing. Appreciate your sharing, Brian! Well-said, Brian! I totally agree. We homeschooled our four children, now young adults, and it was the best choice for us, but others should also have the freedom to choose their paths. I’ll look forward to part 2 of your story. Brian, this is such a reasonable introduction to homeschooling choice. I completely agree with you. I’ve noticed that media reports on homeschooling tend to generate hundreds of comments, many very negative. I consider myself a homeschool ambassador and try to debunk myths and offer helpful information. This is not to convince people to homeschool but to recognize it as a viable choice just like public school. Leave a Reply to Brittany Thayer Click here to cancel reply.